Mumbai-based Avehi Public Charitable Educational Trust is popular for its contribution in revolutionizing the teaching-learning format being followed since three decades across municipal schools in Mumbai. Avehi’s credo is to make learning more fun and more relevant! Avehi is among the few established NGOs that introduced innovative activity-based course content and teaching methodology through two successful projects – Avehi Abacus & Sangati. Collectively, the projects offer constructive learning and valuable lessons on communal harmony, secularism, environmental science, social justice, gender sensitivity and other such topics that would help in the holistic development of students who are at the cusp of their adolescent and adult lives. Recognizing the impact that the new format would make, the Ministry of Human Resource Development and other central and state government agencies funded Avehi’s projects in the initial years. Apart from Avehi; Parisar Asha, Meljol and Eklavya are the other NGOs which do similar work. They utilize their social and financial education curriculum to provide children with the necessary opportunities to contribute responsibly to their community. At present, Avehi’s projects are delivered to several thousands of children each year across 24 wards in Mumbai through 923 municipal schools. This reach is remarkable. Avehi started out with one school and 35 students in 1990. The teaching material is published in 8 different languages; helping assure that the values and messages incorporated in course curriculum are delivered appropriately to each student. Not only municipal schools benefit, but Avehi is also comfortable sharing its content developed in-house in private schools. There are a few schools in Gujarat and Mumbai which use Avehi’s teaching materials. Avehi’s Resource Center has a collection of more than 1,000 media materials on various themes such as health, women, education, environment, legal awareness, communal harmony etc. These are suitable for audiences of different ages, educational levels, linguistic and socio-economic backgrounds. Ms. Simantini Dhuru, one of the trustees, represents Avehi on NCERT’s textbook development committee to review the environmental studies curriculum and write textbooks for Grade 3rd to 5th. 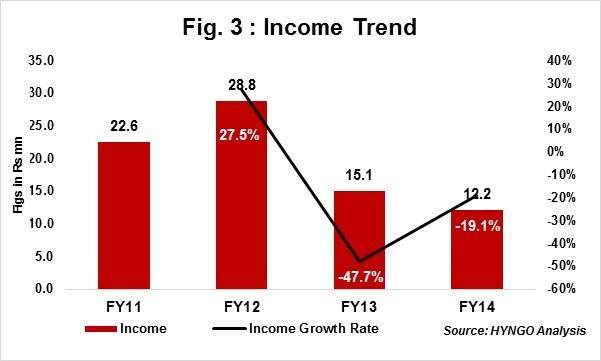 Total Income dropped by 19% Y-o-Y during FY14. The decline was owing to substantial decrease in funding from institutions (-95%) and general donations (-47%) (Refer Fig. 1). Contribution from foreign sources during FY14 increased 44% Y-o-Y and accounted for 83% of total income in FY14. Asha for Education continued to remain the major source of raising funds from offshore donor communities. 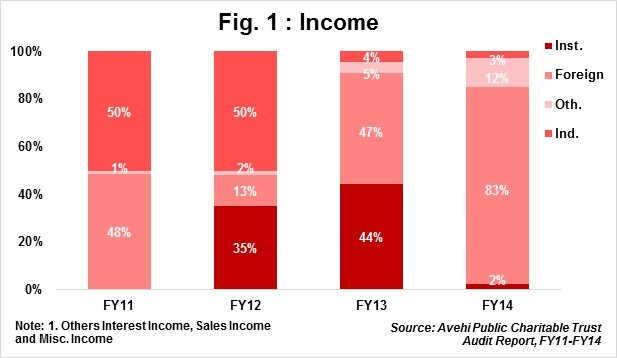 On average, Avehi has raised 79% of its total foreign income during FY11 to FY14 through Asha for Education (Refer Fig. 2). Other foreign donors who contributed in the past 4 years include Johnson & Johnson, Manos Unidas, American Association of Orthodontists Foundation (AAOF) and others. Out of total expenses incurred during FY14, 93% was spent on direct programme activities, i.e. creating and publishing content for the audio-visual resource centre and printing kits for Avehi-Abacus and Sangati programs. The cost to print and update one kit is approximately Rs3,000. These are sent to all municipals schools in Mumbai each year. Program salaries doubled in FY14 i.e. from 6% in FY13 to 11% in FY14. The spike can be attributed to honorarium paid to professionals hired for media support. Earmarked Funds has remained unchanged at Rs4.3mn since FY10. The fund is classified as ‘Endowment Fund’ and includes contributions from donors like British High Commission, Sadbhav Foundation, IDBI, and Penguin. Self Sufficiency Ratio (SSR) measures the capability of an organisation to meet its operating expenses from its own income (service charges, sales income, individual donations and interest fee). SSR for Avehi during FY13 was 14%, suggesting a strong need for generating own income sources. Despite steady income from foreign sources (average of 48% of total income during FY11 to FY14), it is critical for Avehi to garner interest among domestic corporates. Committed Donors: Sir Dorabji Tata Trust, Asha for Education, All India Forum for Right to Education, Sonrisas De Bombay, Penguin, AID Chicago, AAOF and others. Sustainability. With recurring deficits and limited funds for operations, Avehi is uncertain about steady organizational growth. To overcome this risk, Avehi has started capitalizing on valuable proprietary content it has developed to become self-sustained. The content is shared with private schools for a nominal fee across India. Institutional Donors. Due to amendments in donation criteria, funding agencies like CRY and UNICEF had to stop sanctioning grants to Avehi. This has dramatically affected Avehi’s cash inflows. Since Avehi doesn’t directly work with children; corporates and other funding agencies are often reluctant to support their projects. Founding member, Late Ms. Shanta Gandhi is even today respected for her remarkable contributions in reforming the education system in the India. She has chaired several child-centered organisations and was among the core team to set up Bal Bhavans across India. The Board includes seven trustees, all of whom are known for their notable contribution in the fields of education, media, entertainment and social work. All the trustees are actively involved in the operations of Avehi. Most trustees have been associated with Avehi since 1991. Board Meetings are held three times in a year and minutes of the meetings are circulated to all members. Avehi has an efficient in-built monitoring system that tracks the performance of each student and teacher across all the schools it works with. Regular meetings are held with teachers to address the challenges they face. Course content is regularly updated and shared with schools.